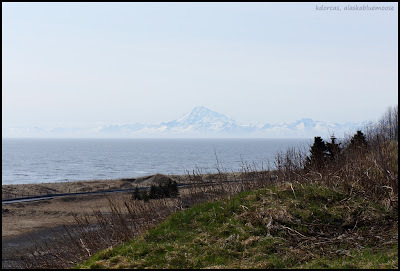 Milena and I went to a park yesterday after her school; here are two photos from the Mouth of the Kenai River. It was such a beautiful day. We picked up a couple of "libations" - she, white chocolate chocolate and I a decaf latte, respectively, LOL. Today we will have an "overnighter." Looking forward to some fun time. Absolutely stunning Karen! I still see plenty of snow over Mt. Redoubt but I guess that is pretty much how it remains?? ?